This four hour intensive provides a deep exploration of the concept of faith. 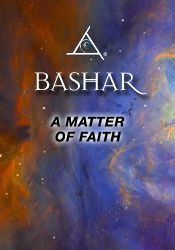 Bashar takes us on a journey through the duality of faith vs. doubt to the next level of understanding-- "the power of knowing". This session provides the next stage of consciousness evolution and includes exercises designed to crystallize your comprehension of knowing what is true for you. Q&A: Happy Birthday to Bashar. Making a paper airplane with closed eyes. Gaining prosperity through surrender. Are Darryl's genetics a part of Bashar? A comparison between the crystals at the event and the feelings that would result from meeting Bashar. Which ET's will make first open contact? How should I imagine myself when I contemplate "I AM?" What is the nature of individuality for a non-physical spiritual being? What is the pivotal nature of my gifts, vis-?É -vis children and dance? Ad ream regarding the recent wildfires in California and the questioner's dog. Shifting to a parallel reality where the house did not burn down. Numbers that recur throughout a lifetime. Discussion of the benefits of democracy vs. republic. Feeling a pure, absolute consciousness and exploring the idea of expansion of consciousness. When is our solar system supposed to cross the photon belt? Having impact. Technical clarification of the meaning of "frequency" as it applies to non-physical ("higher frequency") beings; the nature of "frames of non-physical reality"; and the nature of time. Question about meeting Bashar in a time-suspended arena. Where does existence come from? How come there isn't just nothing? What is an average day like for Bashar? Question about a dynamic encounter the questioner had with several beings when she was very little. Being an "absorber" of the energy of a place. The shift in consciousness experienced by the woman whose home almost burned. Are mathematics basic to reality? What is the significance of the number seven in New Age literature? If I imagine something, does that means it exists somewhere? Preparing for a job interview by choosing the reality we prefer. How physical healing is accomplished. Why is it so hard to walk the walk concerning faith when the chips are down? The limits of what is possible through faith in this reality. Technical terminology Bashar uses to describe time and space. The 11-dimension model of space known as M-theory. Challenges to the questioner's faith (and Bashar's attempt to bring the her beyond faith). A discussion of the definitions of positive and negative. Can human evolution lead to certain super abilities (e.g. radical spontaneous change in human form, flight, spontaneous regeneration) becoming more real?